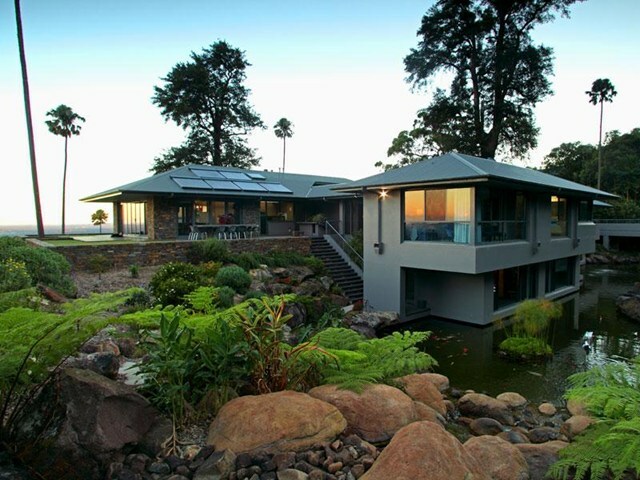 A large scale residential build in the hills of Meroo Meadow and one of the most rewarding projects we have had the pleasure of working on. Stonehedge was commissioned by Gae to oversee the extensive array of stonework for her new property incorporating an entrance way, feature walls and columns for her home, har har walls, a fireplace complete with stone lounge and horse stable feature walls. Gae says the stone was a defining element of the build that had to sit well in its surroundings. After some heavy research, we sourced some 200 tonne of stone from a quarry in SA and careful planning on site resulted in some stand out features of a well designed build. Always a pleasure to deal with, Gae made everyone welcome each day as she’d trot off on horse back to tend to the farm. A stunning use of stone on a broad scale for this wrap around plinth complete with stone lintel connects the occupants with the stonework via the staircase. Brett Hofman of Stonehedge and his team of skilled tradesmen were responsible for all the stone construction at my property, Hillsvale. The team did an absolutely magnificent job! The scope of the work undertaken involved two sets of entry gate walls, feature walls at the stable block, har-har walls forming the platform for the house and terrace, interior stonework for pillars and fireplace. The works were done in a very professional manner, his team was always courteous and the work was completed in the time estimated. I am pleased to recommend Stonehedge.